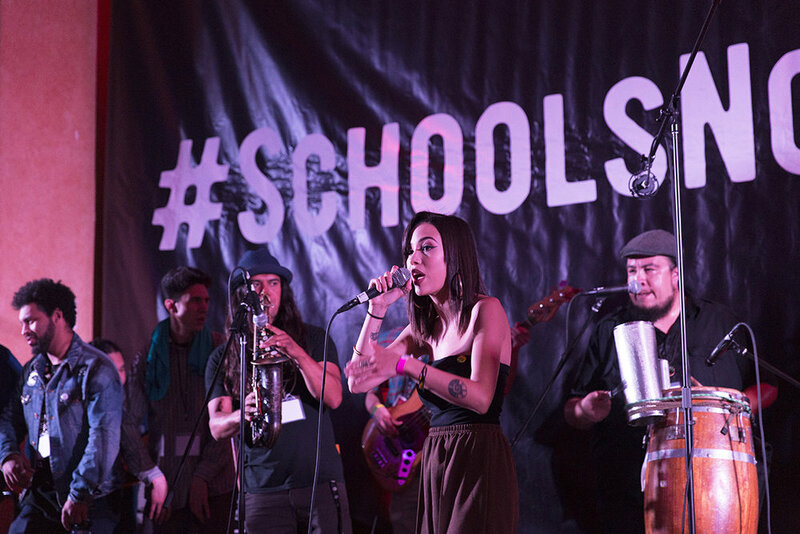 #SchoolsNotPrisons is a free music and art tour that partners with California communities throughout the state that have been impacted by the overuse of punishment and incarceration to ask the question: What really keeps us safe? For decades, California has been overspending on prisons under the mistaken idea that punishing and incarcerating people is what keeps communities safe. It doesn’t. It breaks apart families and communities – especially communities of color, and it is taking opportunity away from our young people. Since 1980, California has built 22 prisons but just one UC campus. And in 2014, youth arrests outnumbered youth votes. Produced by Revolve Impact, and supported by The California Endowment and The California Wellness Foundation, in partnership with the music and entertainment platform TIDAL, the tour promotes non-violence and activism by young people, and ahead of the election, encouraged voting as a key way for communities committed to safety, justice, and peace to join in solidarity to make change. In this experience, culture, art, justice and music collided bringing together leaders like Mike and Claudia de la Rocha, dream hampton, Mystic, Buyepongo, Ty Dolla $ign, Pusha T, and more. As the creative director for visual storytelling on the inaugural year of the tour, Audrey and her team were committed to lifting up local voices and putting them at the center of each vignette. This video series original aired on the #SchoolsNotPrisons Facebook. The Woods is a Los Angeles-based boutique production company, specializing in hosting, storytelling, film, creative direction and business strategy.